Kleefeld on Comics: Support The Underpug -- Er... Underdog! If I'm being honest with myself (which is what I usually strive for) I'm just a putz with a blog that gets read by maybe a handful of people. That this gets read at all never ceases to amaze me. Despite that, however, I'm going to make a blatant plug here to you handful of people to see if I can help someone else out a bit. Ethan Young has been working on his Tails webcomic since 2009. 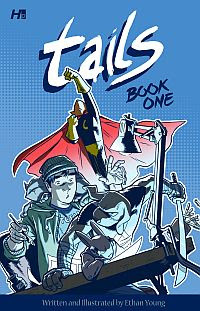 It's a vaguely autobiographical comic which Young has characterized as "equal parts slice-of-life romance, comedy, drama, and epic fantasy." Last year, Hermes Press announced that they'll be publishing printed versions of the story with some updates as well as new features. I interviewed Young about it for MTV Geek at the time. So, for those of you reading, take a moment to check out Tails online. If you like it, ask your Local Comic Shop to order a copy for you (Order #STK457317 in the Diamond catalog) or place an advance order on Amazon. I'm sure Ethan will appreciate the support!